Cacti are easy-care houseplants because their feeding and watering needs are extremely low. You can largely ignore them and they still thrive. But if you’re a chronic overwaterer, cacti may be a source of endless frustration. When your cactus has clearly been overwatered, don’t fear — there is a chance you can save it. If there is no fungal or bacterial rot present, a change of neighborhoods may be enough to get your cactus back on track. 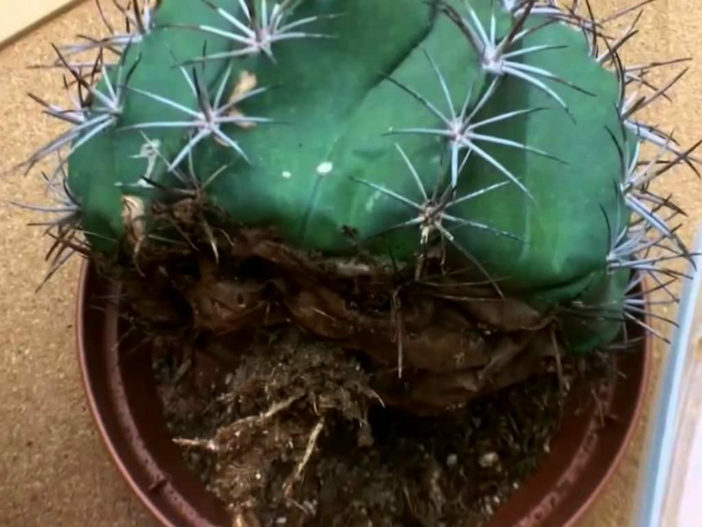 If you suspect overwatering and damage, such as soft brown spots, are obvious on the outside of the cactus, unpot the plant by wrapping a few layers of newspaper around it and tipping the cactus out. Carefully brush the soil from the roots and check them for brown or black areas. Extensive damage may be difficult to fix, but if most of the roots are still white, you’re in good shape. Cut away the black and brown roots and leave the cactus out of its pot to dry. If brown or black rot areas are extensive, you will need to reroot the cactus. A cactus that has only been occasionally overwatered will recover without further drama. When overwatering is a chronic problem, help the cactus to shed as much water as quickly as possible in the future. Select an unglazed clay pot only slightly bigger than the cactus and fill it with a commercial cactus mix. Pot the cactus in the mix gently, so you don’t upset its delicate roots. The clay pot will wick away more water from the root zone while the loose cactus mix allows water to drain quickly and completely. You should only plant very large landscape cacti directly in the ground because landscape plantings give you less control over drainage. When roots or tissues are extensively damaged from overwatering, use a sharp, clean knife to cut away all the rot from the cactus. Even a small portion of healthy tissue can regenerate a whole plant, but if you leave the rot behind, it may continue to spread. Allow the cactus to dry on the counter for several days until a thick scab forms on the cut sections. Place the remaining cactus section into a clay pot with cactus soil and bury it about 1 inch (2.5 cm) deep unless there isn’t much of the cactus left — in that case, bury it about halfway. Don’t water the cactus for the first week, and only water sparingly after that until new growth appears. Once your cactus is repotted and ready for success, correct watering is vital to prevent new problems. Only water cacti when the top 1 to 2 inches (2.5 to 5 cm) of the soil — depending on the size of the cactus — is completely dry. Do not water the plant from the bottom and never leave it sitting in a saucer of water. It is much better for cacti to be dry than to be wet — a good rule of thumb is to water about once every 10 days.